Chronic suppurative otitis media (CSOM) is a common ENT problem and still remains the commonest cause of hearing impairment which can be prevented / treated. Conventionally, hearing loss described in CSOM is air bone gap i.e. a conductive hearing loss. But, it has been observed that some patients displayed an added sensorineural component to their conductive hearing loss. On reviewing the literature, it was evident that the issue of SNHL in CSOM with or without cholesteatoma still remains a matter of debate. Even the patients who have a definite raised bone conduction (BC) threshold do not have any symptoms of labyrinthitis. Thus, 100 patients suffering from unilateral CSOM with chosen criteria were selected. Otologic history and examination, and audiometry findings were recorded and analyzed statistically. The primary objective of this study was to evaluate the incidence and degree of sensorineural hearing loss in CSOM and also to find the correlation between S.N. hearing loss (if any) with the age of the patients, duration of the disease and the surgical findings observed. The present study was undertaken in the Department of ENT and Head/Neck Surgery, at our institute. The study group included the patients those were operated in the institute for CSOM. The patients had to meet the following criteria to become eligible for the study. The patients had to be suffering from unilateral CSOM with normal contralateral ear. The normal ear was used as a control to cancel out the confounding factors such as presbycusis, noise induced or congenital hearing losses etc. The subjects between 10 and 50 years of age were included in the study. The children below 10 years were excluded as they were expected to be unco-operative for accurate testing. Also above 50 years, there is a possibility of an element of presbycusis. Subjects with a history suggestive of systemic diseases like diabetes, meningoencephalitis, head injury, familial hearing loss, prolonged noise exposure, previous otologic surgeries were excluded from the study. Detailed otolaryngologic history including hearing impairment, ear discharge, vertigo, tinnitus etc., was taken. Extensive ENT examination was done in all subjects to look for status of otorrhea, site and size of perforation, ossicular disruption and presence of cholesteatoma. Tuning fork tests (Rinne's, Weber's and Absolute BC test) were carried out in all the cases. Pure tone audiometry (PTA) was done in all subjects using an Elkon Audiometer in a partially sound attenuated room. Air conduction and BC thresholds were tested and plotted by a trained audiologist. Narrow band masking was used whenever appropriate. The surgical findings of all the patients were observed and documented. Special observation regarding presence or absence of cholesteatoma and ossicular chain status was made. All these findings were documented as per the study Performa. The age of the subjects included in the study ranged from 12-50 years with a mean of 24.6 years, 36% being males and 64% females. There was no significant difference in the left or right ear. Around 52% ears had history of discharge for less than 2 years whereas only 8% ears had history of discharge for more than 5 years. Atticoantral type of CSOM was found to be in 28% of the study ears. Tubotympanic type of CSOM was seen in the remaining 72% ears. Distribution of various sizes of central perforations was observed as in [Table 1]. Also, it was observed that cholesteatoma was present in 28% ears of the CSOM group. However, ossicular chain was eroded in 20% ears of the CSOM group and in rest 80% it was intact. As expected mean AC (air conduction) threshold in the CSOM group was significantly elevated (48.25dB) as compared to the mean AC threshold of the control group. The mean BC threshold in the control group was 12dB and in CSOM group it was observed to be 15.03dB. This difference though not large but was statistically significant (P<0.05) [Table 2]. 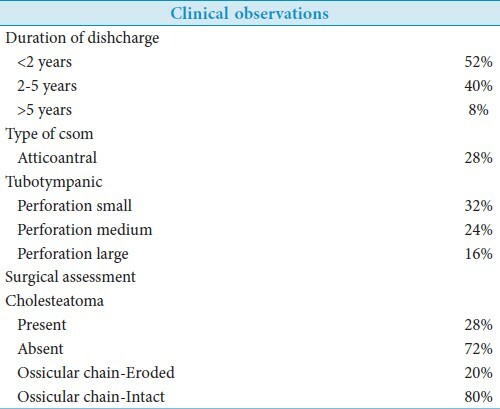 It was observed in CSOM group that mean BC threshold did not increase with the duration of discharge, but it does appear to rise with increasing age and presence of cholesteatoma [Table 3]. However, difference in the BC threshold in the ears with or without cholesteatoma was not significant. 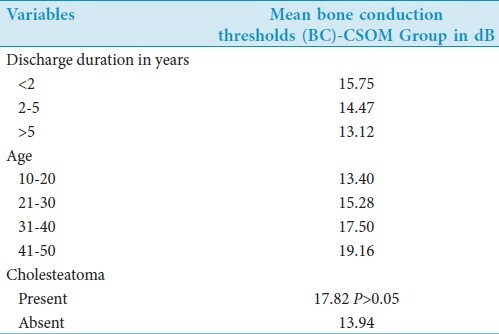 [Table 4] shows means and comparisons of bone conduction thresholds at various frequencies in controls and CSOM group. Higher bone conduction thresholds were observed in the CSOM group. But the difference was statistically significant at 1KHz and 2KHz of the frequencies tested. Conventionally, a conductive hearing loss is expected in a patient suffering from CSOM. Occasionally, elevated BC thresholds have been observed in various audiometric recordings in patients suffering from CSOM indicating a sensorineural (SN) element. On reviewing the literature results from different authors on this issue have been variable. Our aim was to find whether there is any relation between CSOM and SN hearing loss. And if there is any, does the presence of cholesteatoma, duration of discharge or age of the patient affect the degree of SN element. Present study was done in 100 patients of unilateral CSOM. The normal ears formed the control group and 100 ears suffering from CSOM formed the CSOM group. Detailed otologic history, clinical, surgical, and audiometric findings were recorded and analyzed. The mean difference in the preoperative BC thresholds in the normal ears (control group) and ears suffering from (CSOM group) was around 3dB. MacAndie and O'Reilly in their study observed that this difference was 5.24-9.02 across the frequency range. Though, this was on the lower side in our study but it was statistically significant. Paperella et al. came to conclusion that SN hearing loss does occur in CSOM, especially at higher frequencies. BC thresholds were also elevated in the CSOM group in our study. The mean differences across the various frequency ranges were 2.6dB at 500 Hz, 3.4dB at 1 KHz, 4.4dB at 2 KHz and 1.8 at 4 KHz. The differences in mid frequencies i.e., 1 and 2 KHz were statistically significant but not at 500 Hz and 4 KHz. Papp et al. in their study concluded that BC threshold shift was more accentuated as the age increased. In our series, there was a gradual elevation of BC thresholds from 13.40dB in 10-20 years age group to 19.16dB in 40-50 years age group. Thus, detailed statistical analysis of our study along with the review of available literature on the subject, it is hereby inferred that CSOM can cause variable degree of SN hearing loss. Moreover, if definitive treatment is done earlier, a greater number of patients presenting with mixed losses may be prevented. This is important in view of the fact that National programme prevention and control of deafness is already underway in India. In the analysis of sensorineural hearing loss in CSOM with and without cholesteatoma, the following conclusions were drawn. Chronic otitis media appears to be associated with sensorineural hearing loss, but the degree of SNHL is small in majority of patients. The degree of SNHL did not bear any correlation with the duration of discharge. Greater SN loss is present in the ears suffering from CSOM with cholesteatoma, but it is not significant. Although, we have concluded that there is an association of CSOM with SN loss, still a study with a large sample size is needed to evaluate the role of cholesteatoma. It can be further studied that whether an early surgery in CSOM can prevent an added SN loss or not. 1. de Azevedo AF, Pinto DC, de Souza NJ, Greco DB, Gonçalves DU. Sensorineural hearing loss in chronic suppurative otitis media with and without cholesteatoma. Braz J Otorhinolaryngol 2007;73:671-4. 2. Papastavros T, Varlejides S. Reversible and permanent bone conduction threshold shift in cases of CSOM. Am J Otol 1986;93:623-9. 3. Paparella MM, Oda M, Hiraide F, Brady. Pathology of sensorineural hearing loss in otitis media. Ann Otol Rhinol Laryngol 1972;81:632-47. 4. MacAndie C, O'Reilly BF. Sensorineural hearing loss in chronic otitis media. Clin Otolaryngol Allied Sci 1999;24:220-2. 5. Redaelli de Zinis LO, Capovecchi C, Parrinello G, Antonelli AR. Predisposing factors for inner ear hearing loss association with chronic otitis media. Int J Audiol 2005;44:593-8. 6. Noordzij JP, Dodson EE, Ruth RA, Arts HA, Lambert PR. Chronic otitis media and sensorineural hearing loss: Is there a clinically significant relation? Am J Otol 1995;16:420-3. 7. Paparella MM, Morizono T, Le CT, Mancini F, Sipilä P, Choo YB, et al. Sensorineural hearing loss in otitis media. Ann Otol Rhinol Laryngol 1984;93:623-9. 8. Handa KK, Mann SBS, Gupta AK, Handa A. Sensorineural loss in unsafe chronic suppurative otitis media in paediatric age group. Indian J Otolaryngol Head Neck Surg 1996;48:125-9. 9. Papp Z, Rezes S, Jókay I, Sziklai I. Sensorineural hearing loss in chronic otitis media. Otol Neurotol 2003;24:141-4. 10. Feng H, Chen Y. Analysis of sensorineural hearing loss in chronic suppurative otitis media. Lin Chuang Er Bi Yan Hou Ke Za Zhi 2004;18:579-81. 11. Engel F, Blatz R, Kellner J, Palmer M, Weller U, Bhadki S. Breakdown of round window membrane permeability barrier evoked by streptolysin O: Possible etiologic role in the development of sensorineural hearing loss in acute otitis media. Infect Immun 1995;63:1305-10.